In the “Today Show” “coverage” of TV movie “Sharknado 2” (which just happens to be airing on NBCUniversal owned Syfy), the graphics folks decided to a have a little fun by sending a shark fin wandering across the lower third. 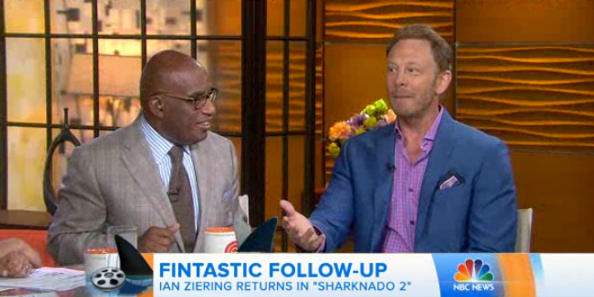 The black fin took periodic trips across the bottom of the screen during the show’s third hour while Al Roker (who also just happens to appear in a cameo role in the film with fellow NBCUniversal employee and “Today” co-anchor Matt Lauer) was interviewing Ian Ziering, who plays a character named Fin (clever, huh?). With all this lovely cross promotion going on we do have one quick question — when do we get to see Al Roker attacked by the giant mechanical shark at Universal Studios Orlando?